Ranked among the greatest pitchers of all time, Nolan Ryan struck out a record 5,714 batters and had 61 shutouts over a career that spanned from 1966 through 1993. Ryan's career saw 324 games won and 292 games lost. 1973 marked the beginning of what would later become a baseball legend when Ryan set a major league record of 383 strikeouts for a single season. However more important than his incredible blazing fast ball or his fantastic durability, Ryan brought back to baseball a concept that had been sorely missing—the idea of an American hero. Ryan was not only a player that others in the game could look up to as a professional role model, but he was also someone that mainstream America could look to as a role model as well. Ryan, unlike others who play the sport today, was never concerned with money. Although he was the first pitcher to earn a million dollar annual salary, Ryan played for the love of the game and it was this love that endeared him to the American populace. variety of other excuses for their own shortcomings. Ryan became a willing role model through his 27-year career and is probably the last who played or will play the game with the old-style courage and skill reminiscent of early baseball. Ryan moved away from Alvin, Texas, in 1965 to Greenville, South Carolina, to begin playing a game that even he did not realize would become his career. Ryan was selected by the New York Mets during the 1965 free-agent draft and played in the West Carolinas League beginning on September 11, 1966. During Ryan's stint with this league, his teammates began to respect his fast ball. Before his playing, his teammates thought his fast ball was just a high school fantasy. Although Ryan lacked true ball control, he nonetheless frightened batters and catchers alike with his scorching fast ball. At times, his pitches had been recorded at speeds well over 90 miles per hour. Even with lack of ball control, it was enough for the Mets that Ryan possessed such pitching skill and as a result they called him up to play in the major leagues at the end of the 1966 season. Ryan had already won 17 games by the start of his major league career. The Mets at that time were in sore need of great players, because until 1969, the Mets had finished last or next to last in every season since the team was founded in 1962. Unfortunately for the Mets, the 1967 season did not bring the great plays expected. Ryan was often homesick and therefore missed much of the 1967 season due to illness, an arm injury, and service with the Army Reserves. Ryan married his high school sweetheart, Ruth, in 1968. She moved to New York City to be closer to Ryan and help ease his homesickness. Her actions helped to improve Ryan's game during the 1968 season. Along with the improved playing ability Ryan achieved during that season, the New York Mets also improved as a team. The Mets added two key people to their pitching staff, Jerry Koosman and Tom Seaver, a strikeout leader in his own right from whom Ryan learned a great deal. This would later prove to be a valuable and much needed management contribution. With these two incidents, the Mets became positioned for their first-ever bid for the World Series in 1969. During the 1969 season, Ryan played as both a starting and relief pitcher, finishing the season with a six win and three loss record. This type of finish soon became the norm for Ryan as he concentrated more on striking out batters than on winning games. Regardless, it was primarily Ryan's pitching abilities that took the New York Mets to the league championships that year and later the World Series. Ryan saved the Mets' bid for the World Series title when in the third game of the series, Ryan made the crucial plays needed to earn the win. The Mets went on to upset the Baltimore Orioles after five games. The New York Mets had finally done the impossible; what no professional commentator thought they could do. With the help of Ryan, the New York Mets had won their first World Series title since arriving in the National League. Even with a world championship title to his credit Ryan still felt uncomfortable and disillusioned in New York, and requested to be traded in 1971. Without much discussion, the Mets agreed to Ryan's request and traded him along with three other players to the California Angels. Because of this move, he was able to distance himself from the East and a climate and location he was never fond of. For Ryan and those three players, the New York Mets received Jim Fregosi, a third baseman. Looking back as players and managers often do, this trade is often considered the worst in the history of the Mets. Once in California, Ryan blasted his way into superstar status. He stayed with the Angels for eight seasons, from 1972 through 1979. With the help Ryan received from both the Mets and the Angels, he began to pitch in a much more controlled and compact fashion allowing for an unbelievably fast delivery across the plate. Ryan had finally reigned in his pitch to a truly skilled perfection of speed and balance. As a result he also struck out more than three hundred batters for the first time. To be more specific, Ryan finished the 1972 season with 19 wins, 16 losses, and 329 strikeouts. With this feat accomplished, Ryan became only the second right-handed pitcher since 1946, when Bob Feller accomplished it, to strike out three hundred or more batters in a single season. With the close of the 1973 season, Ryan became the first-ever pitcher to have back-to-back over three hundred strikeout seasons. Striking out 383 hitters, Ryan set an all-time major league record. This achievement is now challenged only by Roger Clemens of the Boston Red Sox. Additionally in the 1973 season, Ryan became only the fifth pitcher in baseball history to pitch two no-hit games in one season. His first no-hitter came against the Kansas City Royals on May 15. On July 15 against the Detroit Tigers, Ryan pitched his second no-hit game of 1973. The 1974 and 1975 seasons were also quite good for Ryan stat-wise. In the 1974 season, Ryan pitched his third no-hit game and completed a third season of over three hundred strikeouts. The 1975 season saw Ryan complete his fourth no-hit game. Ryan now became only the second pitcher in major league history to achieve this feat. This accomplishment was first achieved by Sandy Koufax during the 1960s while playing for the Los Angeles Dodgers. Critics and opponents of Ryan and his games believed his career was all but over when in 1975 he underwent elbow surgery. This surgery usually spells the end for a pitcher, therefore such criticism was expected. Not wanting to stay away from the game he loved, Ryan reappeared on the baseball season larger than life in 1976. Ryan closed the 1976 season with 17 wins, 18 losses, and 327 strikeouts. Impressing doubters even more, Ryan closed his 1977 season with 19 wins, 16 losses, and 341 strikeouts. Again Ryan completed back-to-back over three hundred strikeout seasons. Although Ryan played some of his best games with the California Angels, he still longed for his native Texas. His break came when at the end of the 1979 season when he became a free agent. Ryan was immediately signed with the Houston Astros and became baseball's first pitcher to earn a million dollars a year. Although this amount is common by today's standards, when it was awarded to Ryan, such a sum was unheard of. After taking some time to readjust to a newer pitching style introduced by the National League, Ryan showed off his adjustment by pitching his fifth no-hit game in 1981. Effectively breaking Koufax's record, Ryan, it was widely thought, was well on his way to setting even more major league records. Unfortunately for Ryan, rather than setting records, he failed to even match his own prior performances. Essentially, from 1984 until the 1987 season, Ryan was continuously placed on the disabled or the injured reserve list. Ryan rarely pitched a game during this time and has always felt that it was the worst time of his professional career. He was especially concerned about his fellow teammates who had to make the difference even without Ryan to pitch his all-star games. The 1987 season saw not only a rejuvenated Ryan, but new records as well. His legendary durability and willingness to play despite great personal discomfort, landed him his second ERA (Earned Run Average) title with a 2.76 average. Ryan's first ERA title was in 1981 in which he attained a 1.69 average. Additionally, Ryan became the first pitcher in baseball's history to attain 2,000 strikeouts in both the American League and the National League. After completing his contract with the Astros, Ryan again became a free agent at the end of the 1987 season. He again was quickly picked up, this time by the Texas Rangers in time for the 1988 season. Ryan had hoped that perhaps with the Rangers, despite his age, he might again have a chance at playing the World Series again. With only four and one-half games separating the Rangers from the division leader, Chicago, this possibility seemed probable. This desire had followed Ryan since his departure from the Mets. Although, Ryan would not see a championship playoff with the Rangers, he did attain his sixth no-hit game and led the American League in strikeouts by the close of the 1990 regular season. Additionally, while playing for the Rangers, Ryan attained his record setting seventh no-hit game against the Toronto Blue Jays. On September 22, 1993, on Nolan Ryan Appreciation Day in Seattle, Washington, all that Ryan dreamed of and played for came to an abrupt halt. For the pitcher that was to strikeouts what Hank Aaron was to home runs, for the man who pitched more strikeouts and no-hitters than anyone who had played the game to that point—the final call was made for Ryan. Although he planned to retire at the end of the 1993 season, he expected to do so with the grace and dignity deserving of his accomplishments. Instead fate or should one prefer, Father Time, took that from Ryan. After feeling his right elbow pop with pain from a torn ligament in the middle of the Rangers game against the Seattle Mariners, Ryan knew his chances at the World Series were over. Ryan was sidelined for the rest of the game, giving him ample time to reflect on his 27-year career. Although Ryan had technically done little to help the Rangers in their bid for the American League West title, especially with his 115 days on the injured reserve list, he still felt somehow personally responsible. When it finally settled in on Ryan he was crushed. At 46, Ryan walked off the field that day giving to baseball and its fans something that will not be seen again. As an athlete, Ryan defined his own class and style. He attained the 5,000 strikeout mark at the age of 42, when most professional sports players had long since retired. A physical wonder, Ryan was still throwing out his legendary fast balls, clocked at 95 miles per hour at the age of 46. Fast ballers, so it was thought, were supposed to lose their edge, break down, and rely on deceptions to keep the ball "unhittable," but not Nolan Ryan. Age only appeared to perfect his ability. 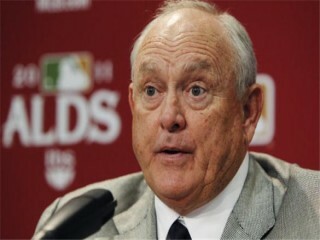 View the full website biography of Nolan Ryan.